How Will Future Technology Effect Your Business? Technology is advancing faster than ever and it’s making more and more businesses and jobs obsolete. Is your business ready to innovate? While no one is able to predict the future with 100% accuracy, knowing what the future might hold with any degree of accuracy can give you a monumental advantage over your competition. Technology such as driverless cars and 3D printing are revolutionizing the way live. How we buy those things is changing, too, with more transactions being done through cryptocurrencies. Even where we live, how we eat, and what we wear is going to change dramatically thanks to changes in technology. We’ll see more items being printed at home, more drone deliveries, and more automated health care than ever before. Now is the time to start preparing your business for changes that are coming in the next five, ten, or fifteen years. 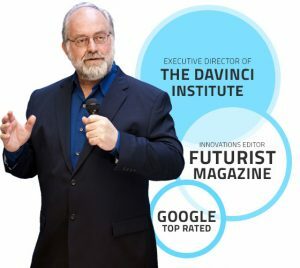 Futurist Keynote Speaker Thomas Frey can help you find the path your business needs to succeed. Contact Thomas Frey as a keynote speaker for your next conference. He has spoken on a variety of topics ranging from the insurance industry to banking to transportation and more, and can customize a presentation that focuses on the needs of your business, just as he’s done for NASA, IBM, Disney and other major corporations. Schedule your talk today.